Today’s all about our bookish wish lists. Of course there are already some great books out there that are EXACTLY (or almost exactly) what we wanted. Or that are what we didn’t even know we wanted. But for all those great books, there’s still so much still left on the wish list. Things we want to see more of. 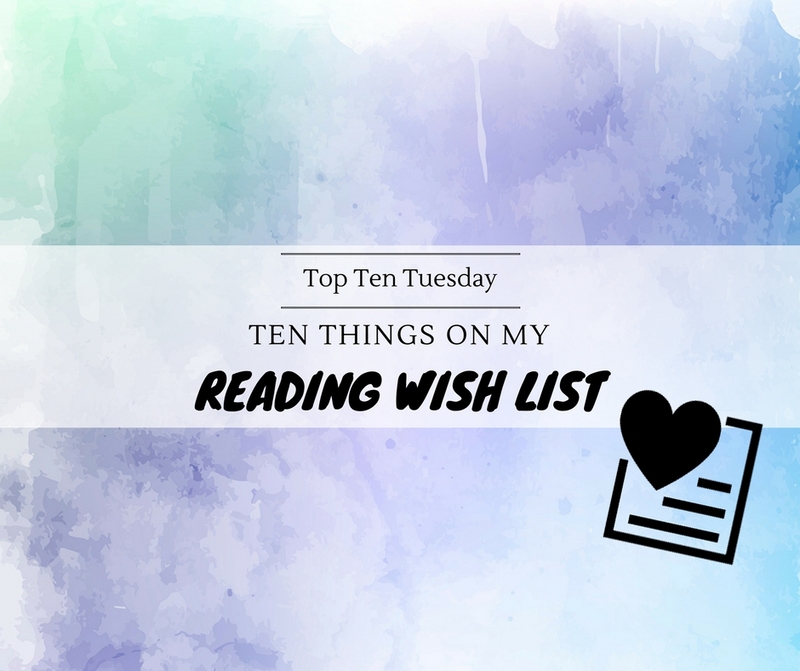 From the super general and vague to the oddly specific, here’s ten things on my reading wishlist! I’ve always been fascinated by roadtrips. I feel like they have some kind of therapeutic value and while I’m dreaming of going on my own epic roadtrip, I love reading about them. But there don’t seem to be that many about them out there, so I need more! After finishing the Red Winter trilogy by Annette Marie earlier this year I am on a Japanese mythology kick. Dragons will always be cool, don’t get me wrong. BUT I WANT MORE KITSUNES! Please? Maybe there are already a ton of these out there and I just haven’t been focusing on them. but when I thought about this list, parallel universes is one of the first things that came to mind that I want more of. Could be either fantasy or sci-fi in the style of Fringe or contemporary in the style of Sliding Doors. Well, here comes the obligatory Death Note mention (don’t look at me like that, I’m sure it’s been a while… right?) But one of the things I loved so much about it was the moral ambiguity of Light Yagami and his quest for justice, and even of L, the detective out to stop him. So yes, I need more of THAT. I’ve recently fallen in love with the world of kpop. And I also watched the kdrama You’re Beautiful, which takes place in the (fictional) world of kpop and… I kind of REALLY want a book set in the kpop world. Focus on a boy or girl band, with a few different POV’s and then delve into their relationship with eachother, their management, their fans and how they are dealing with their status as idols. Someone please write this for me? I mean, the possibilities are endless. Enough epic romances (just kidding, I always love a good epic romance). Give me EPIC friendships. In whatever way. Female friendships. Male friendships. Platonic male/female friendships. I need more Sam and Frodo, Safi and Iseult and more Blue and her Raven Boys. First of all, of course I want more diversity in general. And yes, more gay and lesbian rep as well. But I also feel like the other sexualities are severely lacking in representation so I really need more of them specifically. Please give me more asexual characters, aromantic characters, pansexual characters, demisexual character, bisexual characters,… Just, all of them, please? Okay, I have to admit I’ve always had a thing for the Greek God of the Underworld and his relationship with Persephone. And I am just craving great retellings. I guess it’s why I loved ACOMAF so much. And I know there are some more out there, but those I’ve seen have some terrible reviews and I’m super hesitant to pick them up. So please, someone write me a 5-star retelling…? As much as I love YA and stories set in high school, I miss stories set in college and just after graduation, dealing with the stress of job hunting and finding your place in the world. Adult fiction usually skips this part and new adult tends to focus too much on romance instead. So how about some college and post-college stories? what’s on your bookish wish list? Do we have any wishes in common? Yes exactly! Of course we still need more gay/lesbian books as well, but we shouldn’t forget about the rest of the LGBTQ+ community either! And they are severely underrepresented. Snap on the road trips, good list. . Epic friendships is also a good one, I wish I had thought of that. More roadtrips and fandom stories would be awesome, totally agree. Yes to more parallel universe stories (LOVE those) and college/ after college stuff too. YAAS YOUR LIST IS SO PERFECT!! I really want to read more books that focus on friendship first. <3 And yes and yes for more asexual/aromantic representation. I've read two books with asexual protagonists and that seems really sad and lacking!! We need more!! And also omg DEATH NOTE STYLE OF BOOKS FTW. ? I had post college life. I love reading about that time and I feel like there isn’t much out there. And yes there can always be more road trip books!!! Great list!! A great Hades/ Persephone re-telling would be amazing. There’s something so alluring about Greek mythology! Road trips, epic friendships and college stories would definitely be welcome! Maybe a novel that combined the three? I think I’ve only read one book with trans characters, and one with an asexual character. That doesn’t seem adequate really. I would love to read more! Greek mythology definitely has so any great stories! <3 And yes, that's a great idea, a novel combining road trips, epic friendships and college life! I would read that for sure 🙂 Exactly, I don't think I can even directly name 5 books with trans or ace characters and that's just unacceptable. Yes to road trips!! I’ve read some amazing ones, but I would love more! I love morally ambiguous characters too. Give me all the Kaz-like characters! Wonderful list, Lindsey! Totally agree on college/post-college settings. My college years were so great, and I’d love to see that represented more in books. Yes, exactly! I definitely would love some great college stories more than one more high school story (even if they can be pretty great too). Hell Yes to all of this except Road Trips. Which is just a personal taste thing. But I want more friendships and college stories. I want more Aro Ace Pan Trans stories. I want it all!!! Where are all the books set in college at??? It’s like we get tons of high school and then it skips right to working girl in the city or whatever. College is the BEST TIME and I want to read about it! Also, YES to friendships– especially the dudes. I feel like it’s been a WHILE since I read a book with a good bromance in it! Have you read The Star-Touched Queen? It’s a really good Hades/Persephone that mixes in Indian mythology. Oh!! So many great ones on this list! Roadtrips and fandoms are my absolute favorites! I really enjoy Villainous Protagonists and epic friendships too. I would LOVE to see a Hades and Persephone retelling! That’s soo good! Great list! Thanks so much 🙂 I definitely need more roadtrips, fandoms, villainous protagonists and epic friendships too! (Perhaps all combined? 😉 ) And I’m always craving great Hades/Persephone retellings! I love this list! I’m a huge fan of mythology in general and devour anything that’s not your standard Greek/Roman myths. Parallel universes are also great reads. Epic friendships and fandom books, so much YES! Those sound like great wish list asks. Love both – especially the latter. Who doesn’t love another legit excuse to fangirl!? Great list! My blog mate loves Kpop! Oh yes, I can definitely get on board with a lot of these. Specifically with more books about LGBT+ characters, I want Ace characters that are NOT Aro! Every single time (which is almost never) I see someone mention they are including an Ace character, that character is ALWAYS Aro as well. Even within the LGBT+ community, it’s like folks can’t wrap their heads around the fact that someone can be one and not the other. The two are not synonyms. They are not the same thing. Please, I just want an Ace protagonist that still gets their happily ever after with the one they love (bonus points if that partner is NOT Ace). Yes, exactly! They already have such limited representation, ace and aro shouldn’t be synonyms every time. They can be of course, but I completely agree with your thoughts on wanting to read a book with an ace protagonist that is not aro, getting their HEA with a non-ace loved one <3 Please, someone write this! I’m all about epic friendships! We definitely need more of those! I love your list! I especially would love to see more books set in college. Recently I’ve read The Foxhole Court and Fangirl which both take place in college, and it made me realize I want more books like that! I’ve not read many NA books, so it’s like I’m either reading high school or adult. Also epic friendships for the win! We need more Frodo and Sam. I haven’t read Everneath yet, but hearing that it’s a Hades/Persephone retelling WITH a morally gray character just made me add it to my TBR with lightning speed 😉 Thanks so much! I LOVE THIS SO MUCH. YES to road trips (have you read Amy & Roger’s Epic Detour? LOVED that book so much!) and Epic FRIENDSHIPS. That Sam and Frodo gif got me crying, I love these two so, so much. One of my favourite books that features a road trip – and a killer playlist – is “Saving June” by Hannah Harrington. And if you want another book with a cute kitsune check out Zoe marriotts “Name of the Blade” trilogy 🙂 Happy reading! Epic friendships, Yes! We need more epicness. Yesss, I would love to read some more books set during the college / post-college years because it’s at an age where we’re all struggling to find our feet in the big wide scary world. Those that focus on romance are cute, but we need more relatable characters to read about! I’m a big mythology and retellings lover as well, and Greek mythology has always fascinated me. I feel like this is an area that Sarah J Maas would love to write about as well, and I know she’ll rock it. Yes, exactly, more relatable characters struggling post-college would be amazing! YES to Japanese mythology! I’m reading Flame in the Mist right now which is kind of helping but really, there should be more great books out there with Kitsunes (especially) and Yokais. I’m also a great lover of the antihero and having recently finished 6OC duology I’m ready for more morally ambiguous protagonists too! Epic Friendships – YES PLEASE! OOOhhh – Hades and Persephone retellings – YES! ACOMAF was soooooooo gooooood. I’ve just finished ACOWAR and I’m not sure what that was based on if anything? There should definitely be more Kitsunes and Yokai! Oh, but I’m super excited to read Flame in the Mist soon! Epic friendships, I can’t get enough. ACOMAF was amazing! I’m not sure what ACOWAR was based on – there was a bit of the Vassa/firebird myth in there, but that was so small?